The House Judiciary Committee held a hearing Thursday examining the abortion procedures and medical ethics at Planned Parenthood, the nation’s largest abortion chain. The hearing featured testimonies from former abortionist Dr. Anthony Levatino; former Planned Parenthood manager, Sue Thayer; and Luana Stoltenberg, who suffers from trauma and infertility as a result of her abortion at Planned Parenthood. “With a D&E abortion— dismemberment abortion, if you wish— there is no chance of a live birth at all,” Levatino said. “Congratulations! You just performed a D&E abortion. You just affirmed your right to choose.”Former abortionist, Dr. Anthony Levatino, describes the violence of abortion in this moving testimony before Congress. Watch as Dr. Levatino shares what really happens during a D&E abortion procedure, as he pairs his testimony with an investigation from Live Action. 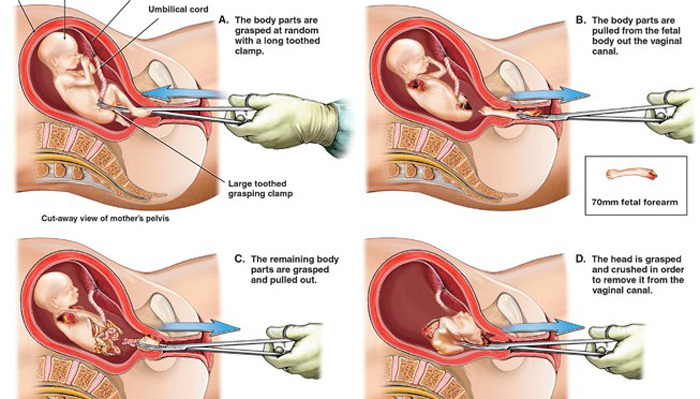 Levatino describes how the abortionist reaches inside the mother’s womb with a clamp and pulls out parts of the child with force. D&E abortion procedures violently tear a preborn child apart limb from torso, and the child bleeds to death in utero. Levatino, who committed over 1,200 abortions, showed attendees a video by Live Action, documenting the horror that is America’s abortion industry. The video reveals grisly details about the inhuman late-term abortion practices and procedures by abortionists and staffers. Imagine for a moment that you are a “pro-choice” obstetrician-gynecologist as I once was. Your patient today is seventeen years old and she is twenty weeks pregnant. At twenty weeks, her uterus is up to her umbilicus and she has been feeling her baby kick for the last two weeks. If you could see her baby, she would be as long as your hand from the top of her head to the bottom of her rump not counting the legs. Your patient is now asleep on an operating room table with her legs in stirrups. Upon entering the room after scrubbing, you dry your hands with a sterile towel and are gowned and gloved by the scrub nurse. The first task is remove the laminaria that had earlier been placed in the cervix to dilate it sufficiently to allow the procedure you are about to perform. With that accomplished, direct your attention to the surgical instruments arranged on a small table to your right. The first instrument you reach for is a 14-French suction catheter. It is clear plastic and about nine inches long. It has a bore through the center approximately ¾ of an inch in diameter. Picture yourself introducing the catheter through the cervix and instructing the circulating nurse to turn on the suction machine which is connected through clear plastic tubing to the catheter. What you will see is a pale yellow fluid the looks a lot like urine coming through the catheter into a glass bottle on the suction machine. This amniotic fluid surrounded the baby to protect her. Congratulations! You have just successfully performed a Suction D&E abortion. You just affirmed her right to choose. You just made $600 cash in fifteen minutes. The hearing comes in response to undercover videos that show Planned Parenthood profiteering from the sale of baby parts. Ten videos from The Center for Medical Progress expose top-level Planned Parenthood executives discussing their role in the trafficking of fetal body parts, manipulating the abortion procedure in order to obtain intact organs, and performing what appears to be illegal partial-birth abortion procedures. The hearing called into question the abortion practices that are ubiquitous across the industry. In the wake of the undercover videos, multiple investigations into the abortion giant were launched at the federal and state levels. Five states have moved to defund Planned Parenthood, and the abortion business’ over $500 million in annual taxpayer funding has been examined with intense scrutiny. Lawmakers have called for a redirection of taxpayer funding from the group in light of lawbreaking and scandal, noting that women would be better served if its public funding is placed into health clinics that provide comprehensive services for women and their families.